Question 1 : SQL Server – Should you update statistics after rebuild indexes? Answer : It depends. Basically there are two kinds of STATISTICS – Index & Column. Rebuilding an index using the ALTER INDEX … REBUILD statement, will update only index statistics with the equivalent of using WITH FULLSCAN. Rebuilding indexes does not update any column statistics. You need to use UPDATE STATISTICS to update column statistics. So it depends if you want to update the column statistics then you should do it explicitly. Question 2 : SQL Server – Should you update statistics after reorganize indexes? Answer : Yes you should update statistics after reorganize indexes. ALTER INDEX … REORGANIZE does not update any statistics. Question 3 : SQL Server – Can you create filtered index on computed columns? Answer : No you cannot. Question 4 : SQL Server – Could you please tell the situation when it is fine to use Cursors? Well the best answer is that when there is no way to achieve the task using a set based approach & you have to follow row by row operation. Till date i have not been in the situation where i had to use a cursor. Also note that While loop is a cursor. It just that constructing a while loop is quite simpler and more straightforward than constructing a cursor. Question 5 : SQL Server – What is Parameter Sniffing? Question 6 : SQL Server – You have a query which is working very slow when executed from application but working fine when executed from SSMS? What could be the reason? Question 7 : Reporting Services – You have 100 columns in your SSRS report and you are exporting this report into PDF format, How do you manage this? You have to set two properties to handle above scenario. Right click on report designer and change below mentioned properties. Question 8 : SQL Server – Provide output of below query. Question 9 : Can you create table in SQL Azure with out clustered index? Answer : No you cannot. Every table in SQL Azure needs to have a clustered index. Unlike SQL Server, every table in SQL Azure needs to have a clustered index. A clustered index is usually created on the primary key column of the table. Clustered indexes sort and store the data rows in the table based on their key values (columns in the index). There can only be one clustered index per table, because the data rows themselves can only be sorted in one order. SQL Azure does not allow heap tables – heap tables, by definition, is a table that doesn’t have any clustered indexes. More about SQL Server indexes in this article on MSDN. That is the rule for all permanent tables in your database; however, this is not the case for temporary tables. Question 4 : SQL Server – Could you please tell situations where it is fine to use cursors? Shall update the answers very soon ! SQL Server – Never use Count(*) in If Exists() for data existence in a Table. Why? Why? Simple because it doesn’t work. In this post I will explain you the same. First let me just create a sample table and insert some data into it. Now we have not inserted any rows means table is empty. now let me just run the code for you. Above query will give excellent execution plan. I hope now things are more clear. That’s all folks; I hope you’ve enjoyed the article and I’ll see you soon with more articles. Both the approaches are sub optimal only and equal in terms of the performance. Although i will prefer the first approach any day since we are not putting any function around column in the where clause. In the both the cases we are index scan but i want seek. So lets go through another solution. We need a little of word around for this. 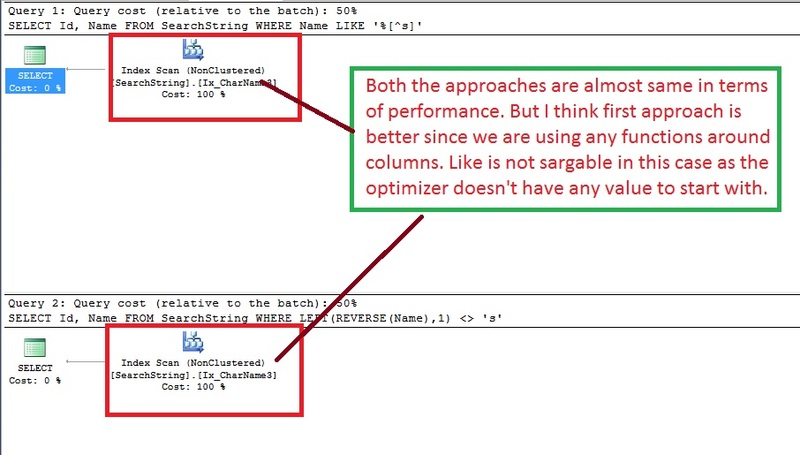 In the above case we have added a computed column and then created a non clustered index on computed column.Lets go through the execution plan of newly rewritten queries. This the best approach (Add a computed column and have index on it) we have, but sometimes we don’t have permissions to alter tables or you have very less data and you don’t care about the performance. In that case you can follow the first approach. Question 1 : I have a sql table that I need to split into more 90 excel sheet based on a code. I could create an ssis package and use conditional split and create more than 90 excel sheet. But creating more than 90 excel sheet one at a time will be time consuming and if I have to use that package again for another table then I would have to make changes. Is there an easier/faster way to achieve split a table into more than 90 excel tabs? Is it possible to use foreachloop and dynamically split and create excel tab? 1. Assuming that have some rules to split the data. Best way to save this information in a table. Question 2 : What are Attunity Driver and why do we user in SSIS? Attunity provides 2 high speed connectors. One for Oracle and one for Teradata. They have been selected by Microsoft to be included with SQL Server 2008 Integration Services (SSIS) SQL 2008 Enterprise Edition. These drivers are highly optimized and very easy to use. Question 3 : How many type of protection level in SSIS package? It is a package level property. It is used to specify how sensitive information is saved inside the package. It also specify whether to encrypt the package or the sensitive portions of the package. Question 4 : Difference between Cached Report and Snapshot Report? Question 5 : What are check point and how they work? SSIS 2005 included a feature called checkpoints, which allows you to restart the package if it fails for any reason. During package execution, the last successfully completed task or container is noted in a checkpoint file, and the checkpoint file is removed if the package completes successfully. But if the package fails before completing, the checkpoint file remains available as a reference to the location from which to restart the package. Question 6 : How check point works in for loop? The Foreach Loop container is another atomic unit of work that can be restarted. However, the checkpoint file does not contain information about the work completed by the child containers, and the Foreach Loop container and its child containers run again when the package restarts. Question 7 : Can we apply style sheet in SSRS and how? Question 8 : How to show “No Data Found” Message to end user? 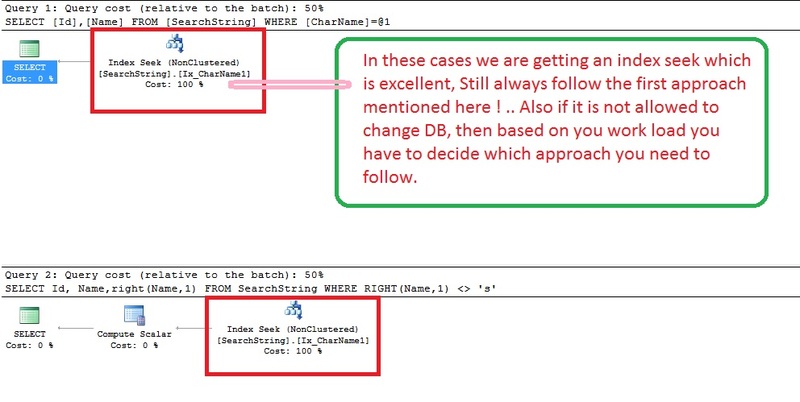 Question 9 : Sometime we need to debug out SSIS Package but we do not want to insert records in destination but still we want to use all the transformations and dump these all records in some dummy destination. The goal can be to check the extraction performance from source OR view data at different points of Package but we do not want to insert data in destination at all. Question 10 : Can we debug SSIS package. If Yes, How? Question 11 : How to create Temporary Table using SSIS? You can use Execute SQL task to create temp table and set the property RetainSameConnection on the Connection Manager to True so that temporary table created in one Control Flow task can be retained in another task. Question 12 : We get the files in our Source Folder all day long. Each file is appended copy of previous file. We want to create a SSIS Package that will load only the most recent file to our table.? Its simple create 2 variables, folderpath and filename. Now in script task, create a loop and find out the latest file. Now you can read the latest file in the script task itself and insert the data into the table. Question 13 : What are Lazy aggregations? Processing mode property of a partition/measure group determines how partitions will be available to users. Processing mode has two possible options – Regular and Lazy Aggregations. Question 14 : How we can ignore failure and continue loop? The Propagate variable in SSIS is used to determine whether an event is propagated to a higher level event handler. This allows package execution to continue once an event is handled in the container that has generated an Error. Question 15 : What are Partition processing options? When you process objects in Microsoft SQL Server Analysis Services, you can select a processing option to control the type of processing that occurs for each object. Processing types differ from one object to another, and by changes that have occurred to the object since it was last processed. If you enable Analysis Services to automatically select a processing method, it will use the method that returns the object to a fully processed state in the least time.Processing settings let you control the objects that are processed, and the methods that are used to process those objects. Process Default Cubes, databases, dimensions, measure groups, mining models, mining structures, and partitions. Detects the process state of database objects, and performs processing necessary to deliver unprocessed or partially processed objects to a fully processed state. If you change a data binding, Process Default will do a Process Full on the affected object. Process Full Cubes, databases, dimensions, measure groups, mining models, mining structures, and partitions. Processes an Analysis Services object and all the objects that it contains. When Process Full is executed against an object that has already been processed, Analysis Services drops all data in the object, and then processes the object. This kind of processing is required when a structural change has been made to an object, for example, when an attribute hierarchy is added, deleted, or renamed. Process Clear Cubes, databases, dimensions, measure groups, mining models, mining structures, and partitions. Drops the data in the object specified and any lower-level constituent objects. After the data is dropped, it is not reloaded. Process Data Dimensions, cubes, measure groups, and partitions. Processes data only without building aggregations or indexes. If there is data is in the partitions, it will be dropped before re-populating the partition with source data. Process Add Dimensions, measure groups, and partitions. Process Add is not available for dimension processing in Management Studio, but you can write XMLA script performs this action. For dimensions, adds new members and updates dimension attribute captions and descriptions. Process Update Dimensions Forces a re-read of data and an update of dimension attributes. Flexible aggregations and indexes on related partitions will be dropped. Process Index Cubes, dimensions, measure groups, and partitions Creates or rebuilds indexes and aggregations for all processed partitions. For unprocessed objects, this option generates an error. Processing with this option is needed if you turn off Lazy Processing. Process Structure Cubes and mining structures If the cube is unprocessed, Analysis Services will process, if it is necessary, all the cube’s dimensions. After that, Analysis Services will create only cube definitions. If this option is applied to a mining structure, it populates the mining structure with source data. The difference between this option and the Process Full option is that this option does not iterate the processing down to the mining models themselves. Process Clear Structure Mining structures Removes all training data from a mining structure. Question 16 : How to make connection with SFTP server? SFTP stands for Secure File Transfer Protocol which is a world wide accepted secure protocol to transfer and access files over a secure channel. The data and channel are encrypted in SFTP mode, which prevents unauthorized access by any intruders and it’s mainly used between companies to transfer secure and sensitive information. You may be aware of the FTP task in SSIS which allows us to copy or paste files to/from a FTP site, but unfortunately SSIS doesn’t support communication over SFTP. A work around for this will be to use PSFTP through an Execute Process Task in SSIS to download the file to our local machine. PSFTP is a SFTP client tool provided by PuTTy (http://www.chiark.greenend.org.uk/~sgtatham/putty/download.html) to transfer files between computer systems using the SFTP protocol. Question 17 : Difference between NONEMPTY vs NON EMPTY IN MDX? Question 18 : Difference between Report Server and Report Manager:? The report server is the central component of a Reporting Services installation. It consists of a pair of core processors plus a collection of special-purpose extensions that handle authentication, data processing, rendering, and delivery operations. Processors are the hub of the report server. Report Manager: Report Manager is a web based tool built using ASP.NET application to view/access SSRS reports. It is not available in SharePoint mode.